The Tube is full of posters for movies I would like to see at the moment: The Lovely Bones, The Road and Up in the Air to name but three. 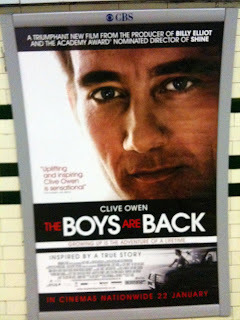 However, at Baker Street and Marylebone, my two local stations, it's Clive's new film that is the most ubiquitous. I've already seen The Boys Are Back, of course, but that doesn't mean I mind being greeted by Clive's brooding face when I step off the Tube; it sure beats all those endless reminders of the oh-so-popular Tube fare price hikes, anyway. Also, it's probably the first time ever I have agreed with a Daily Mail reporter--he provided the somewhat blurry quotation about Clive being sensational.